Sydney consistently ranks as one of the most expensive cities in the world to visit, that’s probably not news to most of you. The GOOD news is that it’s not impossible to visit Sydney on a budget, and there are many free things to do in Sydney that allow you to experience the best the city has to offer. 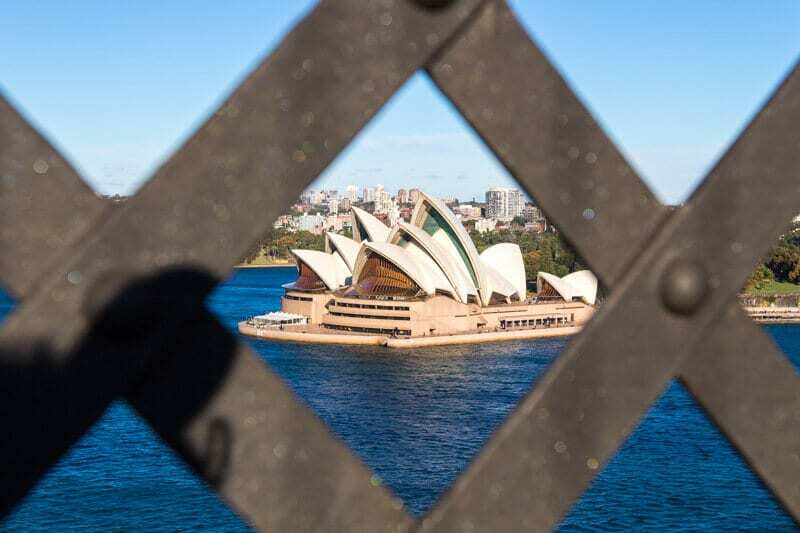 You don’t necessarily have to pay to get to see and experience all of Sydney’s most famous icons and stunning coastal landmarks. 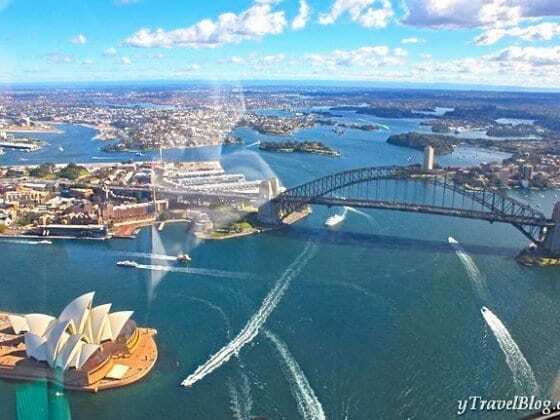 And with some smart choices and careful planning, your trip to Sydney doesn’t have to leave you heavily out of pocket, but full of admiration. Why not start your visit to Sydney with a free walking tour with a knowledgeable local guide? Rain, hail or shine the guys from I’m Free Walking Tours walk every day at 10.30am and 2.30pm. The 3-hour easy walking tours of Sydney will show you the sights and give you your bearings so you can then go it alone. 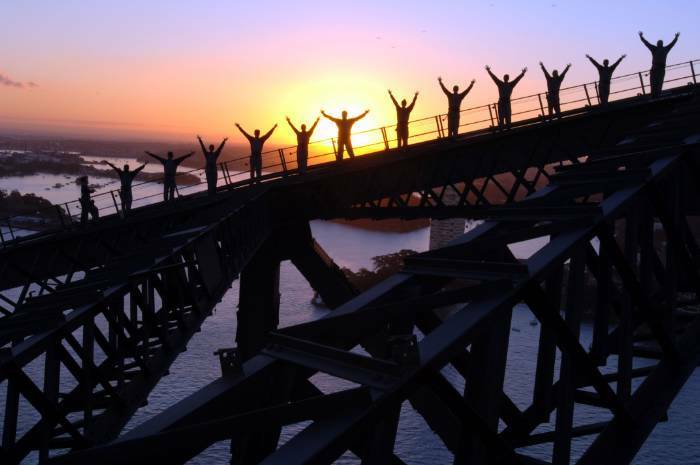 Instead of paying $200+ to climb the Sydney Harbour Bridge, a MUCH cheaper option is to simply walk across for free and take in the same panoramic views on a lower level. Start from The Rocks at the southern end and take the gentle 1.4km stroll across the bridge to Milsons Point at the northern end. Either walk back or catch a train from Milsons Point Station to Circular Quay Station. The Bondi to Coogee Coastal Walk is one of my favourite free things to do in Sydney. It is a stunning walk and the perfect way to spend a gorgeous few hours in Sydney. 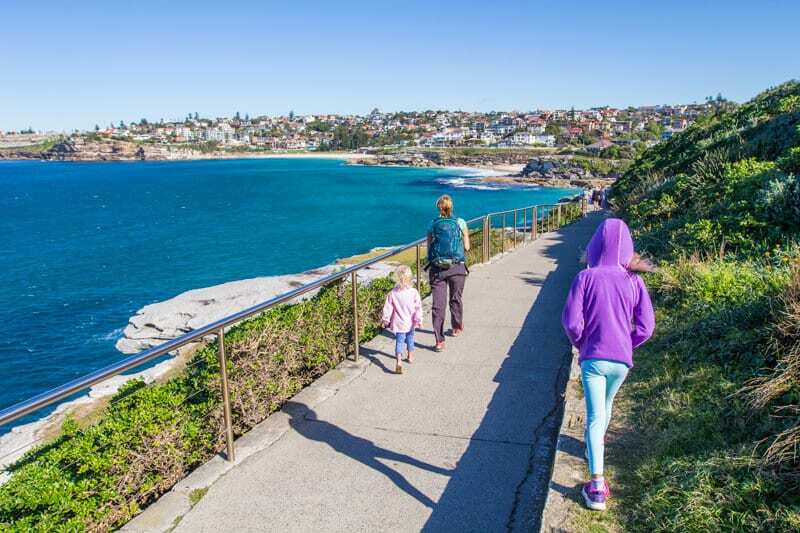 This 6km walk features stunning views of cliffs, bays and rock pools and passes the beaches of Tamarama, Bronte, Clovelly and Gordon’s Bay. Stop along the way for a swim, or stop at a cafe for a drink and bite to eat. To get to Bondi Beach, jump on a train at Central Station and depart at Bondi Junction Station. From there take a bus to Bondi Beach. You cannot beat the serenity of the city and Sydney Harbour views from the Botanical Gardens. Spending half a day in the Gardens is a relaxing and free way to enjoy one of Sydney’s top spots. Pack a picnic lunch, a blanket and a bottle of wine. 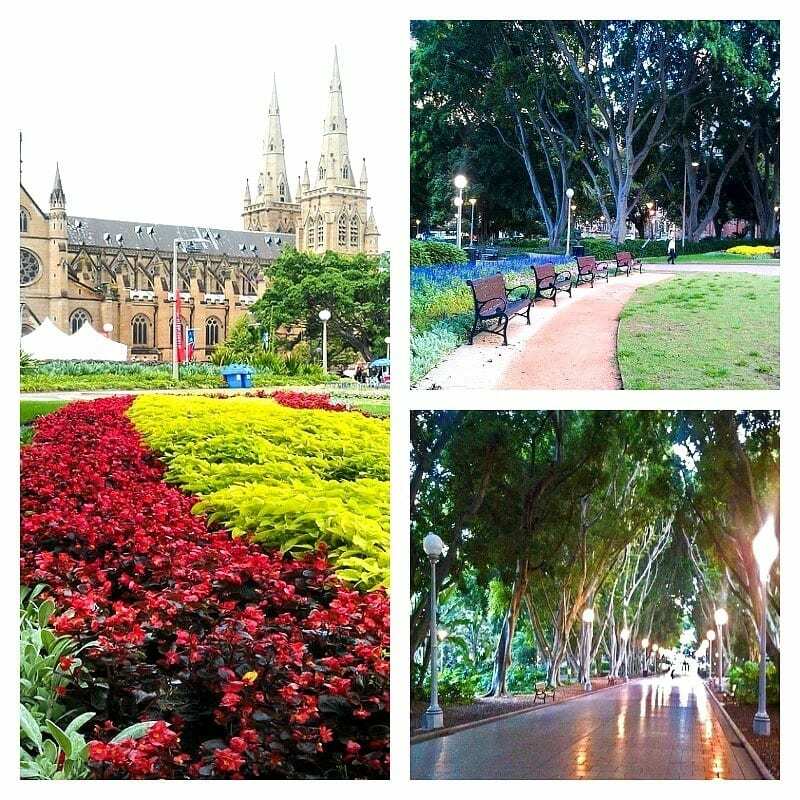 Then take a walk around the gardens to admire the many different types of plants and city views. You can also take a free self-guided walking tour. Be sure to check out Mrs Macquarie’s Chair which has one of the best vantage points in Sydney looking back over the Opera House and Sydney Harbour Bridge. Located in the Domain and overlooking the Royal Botanical Gardens, why not check out Government House, which is the most sophisticated example of a Gothic Revival building in NSW. The House is open Friday – Sunday 10.30am-3.00pm and on public holidays, with viewing by guided tour only. Centennial Park is an oasis not far from the CBD. 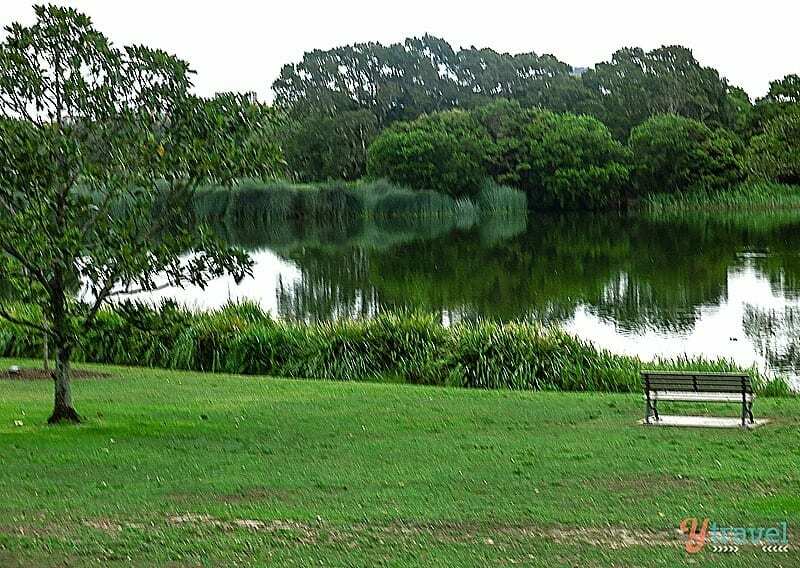 It’s a great place for a picnic and to enjoy Sydney’s lush oasis of ponds, grassy hills and woodlands. Opened as a public open space in 1888 the park was the venue for the inauguration of Federation in 1901, and includes a dedicated cycle and rollerblading track, as well as the opportunity to go horse riding. For information on getting there click here. The Sydney CBD and Harbour front area is very walkable. I often like to walk down fromCentral Station to Circular Quay along either George or Pitt Streets so I can feel the beat of the city for a short 30-minute stroll. 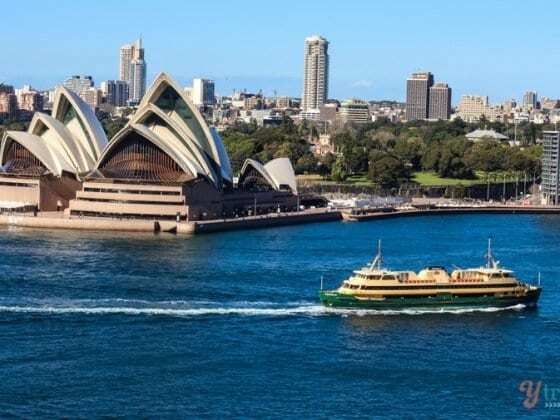 Once at Circular Quay, wander and take photographs of Sydney’s famous landmarks, The Harbour Bridge, Opera House, and enter the Royal Botanical Gardens. Circular Quay is a busy transport hub with many outdoor cafes and restaurants lining the harbour. 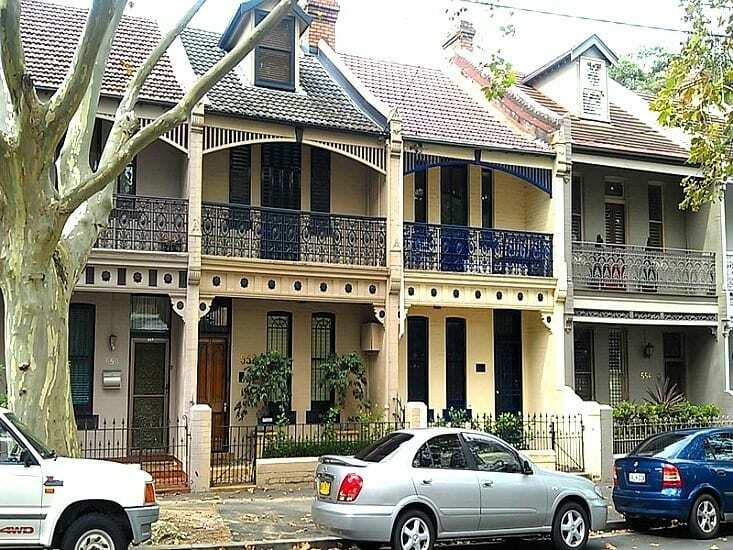 Walk around one of Sydney’s most artistically-vibrant neighbourhoods with old terrace homes. Surry Hills has a great mix of cafes, restaurants, wine bars and pubs serving a wide variety of cooking styles and cultures. Wander Crown Street, Bourke street and Cleveland streets. The fashionable neighbourhood is famous for boutique shopping and the Paddington markets held on Saturdays. Also known for art galleries, cafes, restaurants and rows of pretty Victorian terraces. This lively harbourside precinct is just a 10-minute walk from the CBD and has cafes, a large kids playground and a program of fantastic free Sydney entertainment every week. Stroll along the foreshore of Cockle Bay, admire the boats in the harbour or simply people watch. If you want to eat here on a budget head to the food court. You must explore the historic Rocks District. It’s the oldest section of the oldest city in Australia, and possibly my favourite part of Sydney. 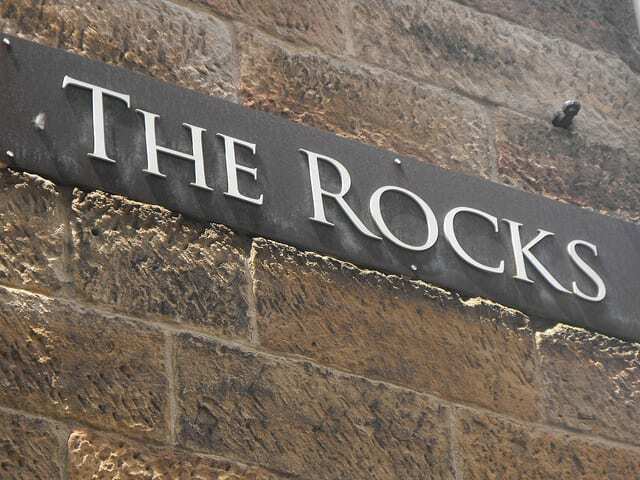 There’s a story around every corner, and The Rocks possesses some wonderful heritage buildings to admire and an intriguing history and cobblestone lanes to explore. Yes, we all love free and this is what you will find when you visit the Rocks Discovery Museum. Spend some time on the three floors learning more about the history of the area and the stories of those who lived there during the early years of white Australia. Don’t want to walk? The free CBD shuttle (route 555) runs every 10 minutes on a loop from Central Station to Circular Quay via Elizabeth and George Streets. The beaches are famous and a must for free things to do in Sydney (besides the parking fees). 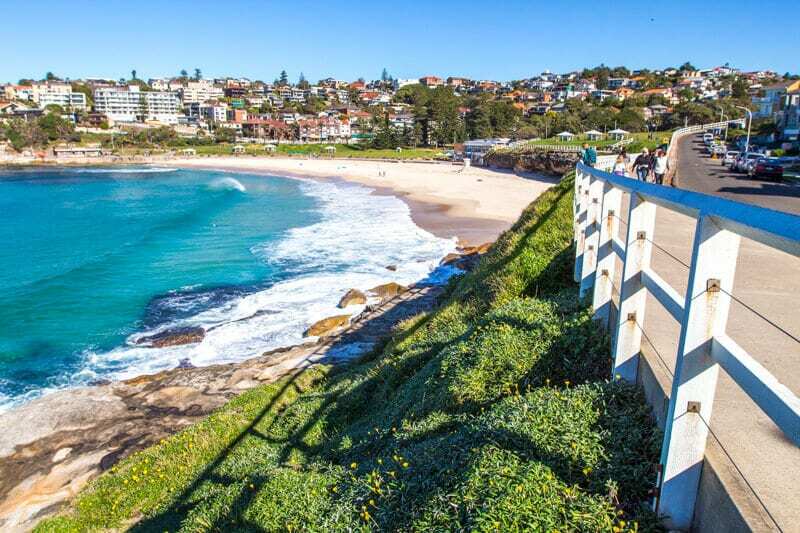 From the Northern Beaches to the Eastern Suburbs you have many great beaches to explore. Our favourites include: Palm Beach, Freshwater, Manly, Bronte, Coogee and you must visit famous Bondi Beach at least once. Hyde Park is Australia’s oldest park and the city’s central open green space popular among office workers who want some fresh air, a quick siesta or some time out from the concrete jungle. Hyde Park contains numerous monuments and statues, and the central pathway through the park is an impressive fig lined road. Over the summer months, the park is a hive of activity. 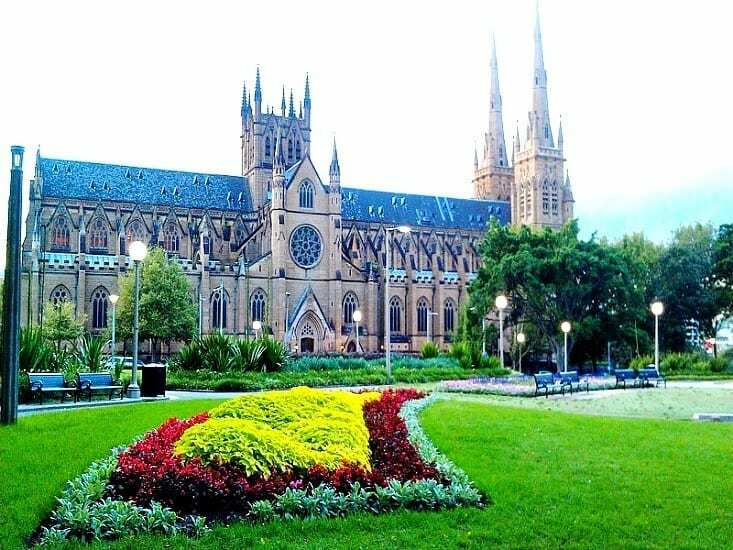 Situated next to Hyde Park, St. Mary’s Cathedral is an English-style Gothic church and a symbol of the spiritual origins of the city, as it was the first Roman Catholic Church in Australia. On Sundays at noon, visitors can partake in free guided tours of the cathedral and crypt. 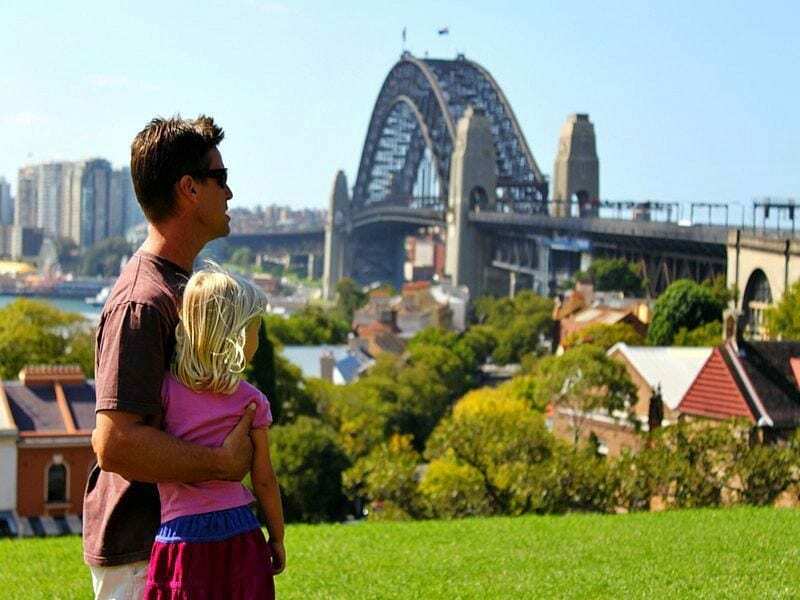 Just behind the Rocks District you will find Observatory Hill, a popular park with locals, workers and visitors. Observatory Hill gives you a million dollar view of the Harbour Bridge and Sydney Harbour and is worth the climb up the hill to take a picture of. Bondi Markets – Open Sundays offering original designer clothing, handmade jewellery, arts, crafts, retro furniture, vintage clothes and more. 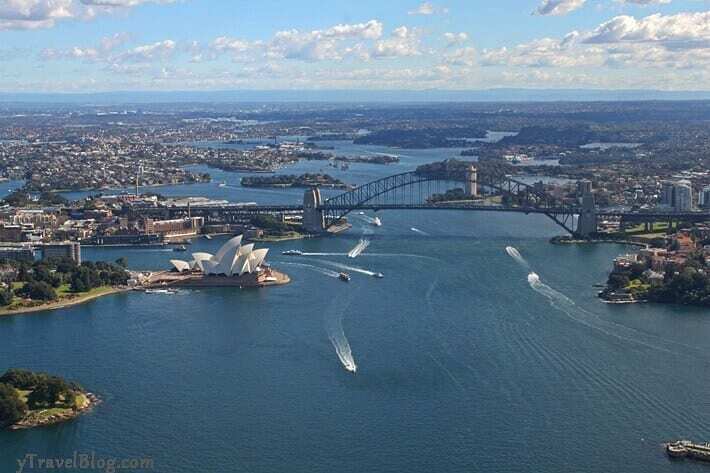 Once you book your accommodation in Sydney, if you time your visit right Sydney puts on some of the best free festivals and events anywhere in the world. New Years Eve – Is there a better setting and fireworks display in the world? And it doesn’t cost anything to see it. Sydney Mardi Gras – One of the largest LGBT pride parade and festivals in the world as thousands of people make their way down Oxford and Flinders St on colourful floats. 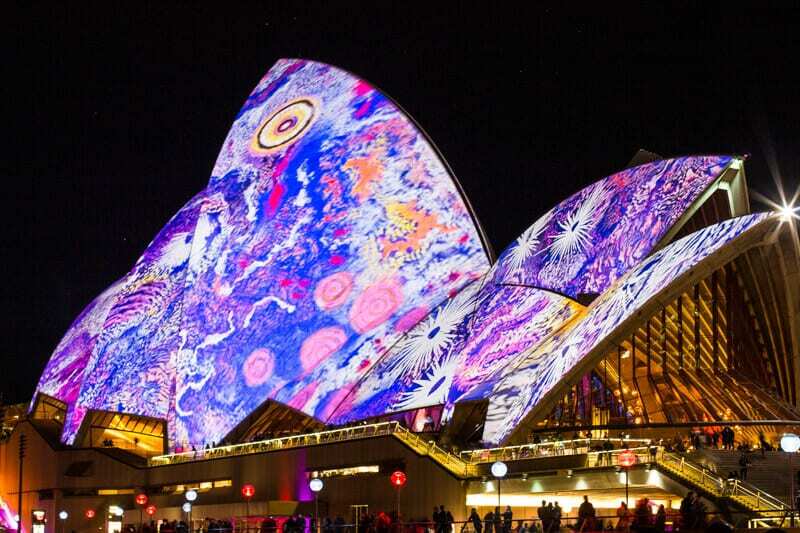 Vivid Sydney – Sydney is transformed into a spectacular canvas of light, music and ideas. The Sydney Festival – For three weeks each January, Sydney Festival offers a program of around 80 events involving artists covering dance, theatre, music, visual arts, cross media and forums. Also, Urban Spoon is a good resource to search cafes and restaurants offering free wireless. The Art Gallery of NSW is free to enter and is one of Australia’s leading art museums with collections of Australian, Aboriginal, European, Asian and contemporary art. 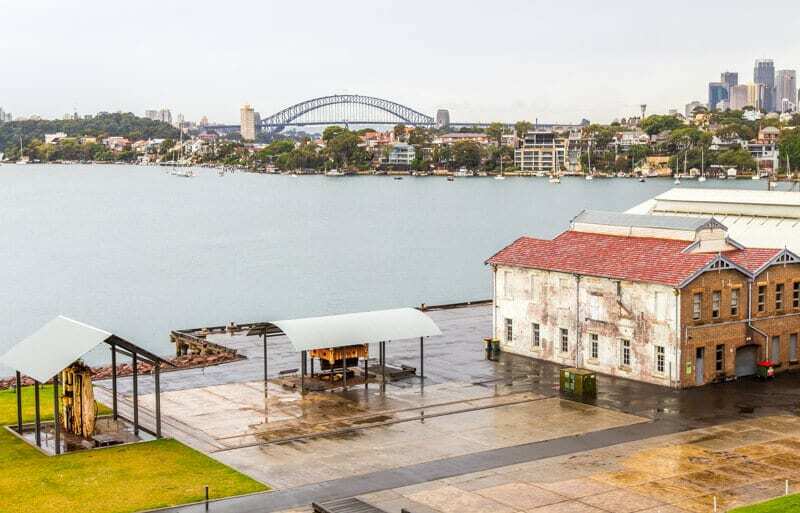 The modern and contemporary works are displayed in expansive, light-filled spaces, offering stunning views of Sydney and the harbour. On the Sydney Harbour Bridge visit the Pylon Lookout for just $11 and get fantastic views plus 3 levels of exhibits and learn about the history and construction of the Bridge. Family Funday Sunday – Travelling with a family? Every Sunday for $2.50 per person you get unlimited travel on all trains, buses, ferries and light rail. Great deal. My Multi Day Pass – permits a whole day of unlimited travel on trains, government and private buses and Sydney Ferries. The $15 return ferry trip to Manly is one of the best ways to experience Sydney Harbour. The scenery on the way over and back is stunning as you cruise by the City Skyline, Opera House, Harbour Bridge and Botanical Gardens. For $18 go up to the top of Sydney Tower, the city’s tallest free-standing structure standing at 309 m (1,014 ft) above the CBD. It has an observation deck with awesome views of the skyline. Find your perfect Airbnb rental in Sydney here. Do you have tips on free things to do in Sydney? Wow, that view from Observatory Hill is amazing – I have never heard of it! Will have to attempt to get there next time I am in town! Yeah it’s a really nice alternative to the usual views of the Harbour and bridge. Sydney is very nice and amazing place. once i am go in Sydney and i really enjoy.. Thank you so much.. There are many historical place in Australia.Sydney is a great place for visit.I went to Sydney with my parents 2012.I enjoyed very much. We are headed to Sydney in September, good to know all the free things to do, Sydney is great but it can be $$$ on your wallet! I love the parks! I try to spend time there in every city I visit. Sydney looks like it has some great ones. Yep, some good parks here mate. The Botanical Gardens would be hard to beat as far as location goes. Top spot! Having taken the free walking tour it’s well worth someones time. Having never been to Sydney before it was a great overview to the city. Yeah, that free walking tour would be a good starting point for most people to get your bearings and get insider tips from a local. Looking froward to your post! Cheers Nicole. You can’t beat free! Thanks for a great article – we have just returned to living in Sydney and we have already done a couple of things on your list! We did the walk across the Harbour Bridge a few weeks ago which is fantastic, checked out the markets and The Rocks and Chinatown (and had a last ride on the monorail). You have a few more things here which we will also check out over coming months. Well, welcome back! Must be exciting to check some new things off the travel list in Sydney. Maybe we’ll see you around soon?? A walk across the bridge is an absolute must! Thanks for sharing this amazing list of places and activities. We are planning to visit in December. Really hoping to get to Australia soon. Glad to know there are plenty of free things to do in a city as expensive as Sydney! Sounds good Beth. Come on down and check it out! Fortunately there are free things to do in every city around the world, and sometimes they are the best things like engaging with the people and just getting lost on foot. ah!!! I miss this city so much! Seeing your picture of the Bondi-Coogee walk makes me smile since Coogee was our favorite beach. I can’t wait until we go back again!!! Coogee is cool. Like Bronte too. And it’s such a great coastal walk. This is a really good, thorough list. 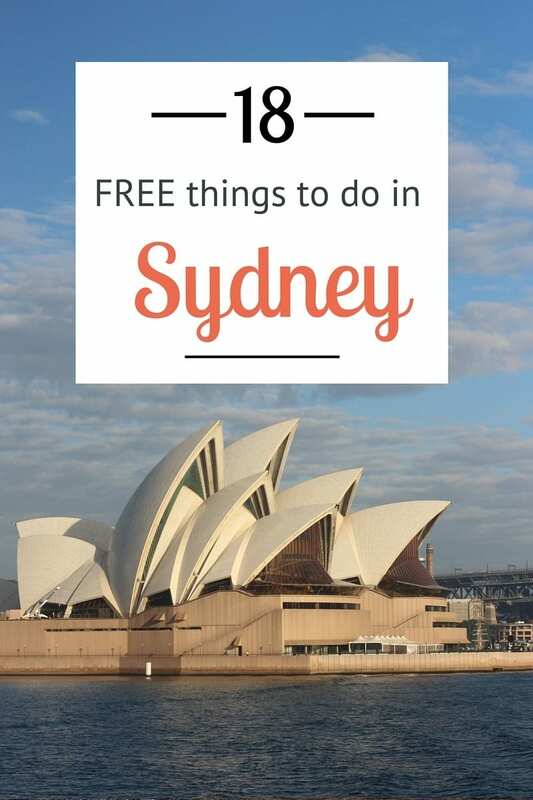 I love the way so many of these free things to do are also some of the BEST things to do in Sydney. Those free walking tours look like an amazing service for travellers, I’m surprised they’re able to do them for free! I’m Brazilian and I’m planning to go to Australia in 2016 (January). It certainly helped me a lot!! Good to hear Leandro. Enjoy Sydney! These seem like great tips, will definitely be making a list to take with me on my adventures this month! The art gallery is free for it’s permanent collections. Great list of things to do in Sydney. I have done a few of these and would really love to do the rest. Wow, that’s an impressive list! Sydney can be an expensive city to live in but its good to see so many options for travellers.. Bondi to Coogee is my favourite but I also love Manly to Spit Bridge walk!! This is brilliant information to know about I am glad I found you! I grew up in Sydney and hold on to some great memories of the city when the old style ferrys cruised the harbour ,lunar park “just for fun” ,the bridge , the opera house being built ,when the amp building was the tallest in the city(25 stories high) .Hanging out at Bronte , Tamarama ,and Clovelly . Doing that walk around the coast through waverly cemetary . Walking the cliff tops when the seas were huge and bodysurfing Tamma point . A beautiful city for sure . Hi Craig & Caz, I was in Sydney last weekend and undertook a lot of these free activities. We also went to Icebergs Ocean Pool at Bondi and had coffee from the pool deck and watched swimmers in the pool and the waves pumping into Bondi Beach. Afterwards we caught the $2.50 Sunday bus over to Watson’s Bay and got take-away fish and chips and sat in the park. Then we walked through The Gap National Park up to a lookout which has spectacular views of Sydney Head, the entrance to Sydney Harbour. I love Sydney for a short break – there is so much to do and see. Nice work! I came to read because I wondered what you’d found for free. It’s a beautiful spot, I like to just walk around the harbour, it’s always great being near water. thank you am going to sydney I n December for a month and can’t wait to c all the sights thank u for all these free tips Eileen ? What a great post! Thank you for all the wonderful tips! My partner and I will be visiting Sydney this month and we will definitely check out most if not all your suggestions! Thanks!? Many thanks for sharing this wonderful info for the first time visitor. Otherwise I was quite worried to gauge the expenses to visit this beautiful city. I am planning to be there by the end of December 2015 on my fifteen days tour and would definitely take benefit of your valuable (free) advices. Your welcome Ahmed. Enjoy your visit to Sydney! We are planning to visit Sydney in April for 6 days. This list is awesome and will help us figure out what to do. One of our prime objectives is see wild kangaroos. Any thoughts on that? My wife and I traveled to Sydney last Spring. Loved the city and so much to see and do. We enjoyed walking everywhere, especially hopping over to Manly for the day. Hyde Park is a great spot to sit back, relax and enjoy a picnic lunch as well! Can’t wait to return! Great to hear Robert. Spring would have been a nice time to visit. Hoping to visit your fine land in early Mar…where might someone take a swim and esp. snorkel around Sydney…any for free? Hazards? Any tour or sm. pkg for a few days for best $ that you might recommend as well…..My Thks! From 1 January 2016, Family Funday Sunday tickets are no longer sold. Really? That’s a bugger. Thanks for letting me know! I am planning a trip to sydney. This is a good list of activities. Thanks for sharing.. This is going to be our “go to list” when traveling this summer with my daughter! Thanks for the great info! Does anyone know if you can tour the opera house – self guided or cheaper than whats listed on their website? Thanks again! Hi Melissa, I don’t think you can do self-guided besides walking around the outside areas. To explore the interior I’m assuming it would only be on a tour. Seems the free CBD shuttle (route 555) that ran every 10 minutes on a loop from Central Station to Circular Quay via Elizabeth and George Streets no longer exists. True. It probably disappeared during this construction of the light rail network up George Street. Thanks for the reminder. Will update the post. Now, i got a nice list of things to do in my next visit. Thanks Craig. This is a great list! Pylon lookout is definitely a winner! Thanks for share these amazing places. Next time when i visit in Australia. Definitely visit on beaches and Royal Botanical Gardens. I visited Bondi – it was too crowded! Took a walk to Coogee – great walk and great beach!! Preferred that to Bondi. The free 555 bus is no longer available. George Street is a massive mess currently as it makes way for laying the light rail. I will be staying in Sydney for 10 days the end of November. I was thinking about renting a car to do a bit of exploring on my own. I would really like to see lots of kangaroos in the wild. Could you recommend any places for me to visit that would be a three hour drive or less from the city. Thank you.